130, HUBCAP USED, 14", 74-77, AMC, GREMLIN, JAVELIN, 12-SLOT TYPE. 2053, Hubcap used, 15", 89-90, CADILLAC, DEVILLE, FLEETWOOD, 12 SLOT TYPE, RED PAINTED RING IN CENTER, MULTI COLORED CREST AND CHROME WREATH, 6 METAL CLIPS. 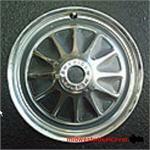 3170a, Hubcap used, 13", 86-87, CHEVY, NOVA, 12 SLOT TYPE, DARK GREY. 361, Hubcap, 15", 71, CHRYSLER, PASSENGER, 12 SLOT TYPE, EXCEPT 300. 395, HUBCAP USED, 14", 78-79, DODGE, ASPEN, POLISHED WITH 12 PAINTED BLACK POCKETS, RAISED CENTER WITH BLACK RING & RAISED CHROME, RED & BLACK LOGO, 12 SLOT TYPE, METAL CLIPS. 55002, 13" USED HUBCAP, 1985, HONDA, CIVIC, CRX, SILVER, 12 SLOT TYPE, GREY ETCHED H LOGO, 4 LUG NUT HOLE, ANTI RATTLE PINS, HELD ON BY LUG NUTS. 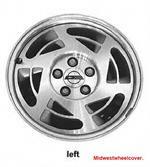 56505, Hubcaps used, 14", 86-87, MAZDA, 323, 626, SILVER, 12 SLOTS, ENGRAVED BLACK WORD MAZDA, 4 LUG NUT HOLES, 12 METAL CLIPS. 56505, Hubcaps used, 14", 86-87, MAZDA, 323, 626, SILVER 12 SLOTS, ENGRAVED BLACK WORD MAZDA IN CENTER, 4 LUG NUT HOLES, 12 METAL CLIPS. 56517, Hubcap used, 13", 88-89, MAZDA, 323, 12 SLOT TYPE. 57001a, Hubcap used, 14", 65-85, MERCEDES, 200, 220, 230/4, 230/6, 250, 280, 300D, 300E, 380, 450, 500, 600, 12 SLOT TYPE, CHROME OUTER RING, DARK BLUE PAINTED, RAISED CHROME LOGO, 4 METAL CLIPS. 57001d, Hubcap used, 14", 65-85, MERCEDES, 200, 220, 230/4, 230/6, 250, 280, 300D, 300E, 380, 450, 500, 600, 12 SLOT TYPE, CHROME OUTER RING, WHITE PAINTED, RAISED CHROME LOGO, 4 METAL CLIPS. 6010, Hubcap used, 15", 98-99, SATURN, S SERIES, SPARKLE SILVER,12 SLOTS TYPE, 4 GRAY PLASTIC LUG NUT, RETAINING CAPS USED. 6010, Hubcap used, 15", 98-99, SATURN, S SERIES, SPARKLE SILVER,12 SLOTS TYPE, 4 GRAY PLASTIC LUG NUT, RETAINING CAPS USED..
6019, HUBCAP USED,15", 02-05, SATURN, L SERIES, SPARKLE SILVER, 12 SLOTS. WITH 5 GRAY LUG NUT CAPS, HELD ON BY THE LUG NUT CAPS. 60516a, HUBCAP USED, 13", 89-90, SUBARU, JUSTY, SILVER, 12 SLOT, BLACK ETCHED WORD SUBARU, PLASTIC CLIPS, WIRE RING. 617, Hubcap, 14", 67, FORD, FALCON, 12 SLOT TYPE. 64195, Used Rims, 14x5, 6 lug, 5-1/2", ISUZU, PICKUP, PUP, 12 SLOT, STEEL, BLACK. 690a, Hubcap used, 15", 70-71, FORD, THUNDERBIRD, METAL, MACHINED, 12 SLOT TYPE. RAISED BLACK CENTER WITH LOGO & WORD THUNDERBIRD, (NOTE: AVAILABLE IN 26 COLORS) METAL CLIPS.